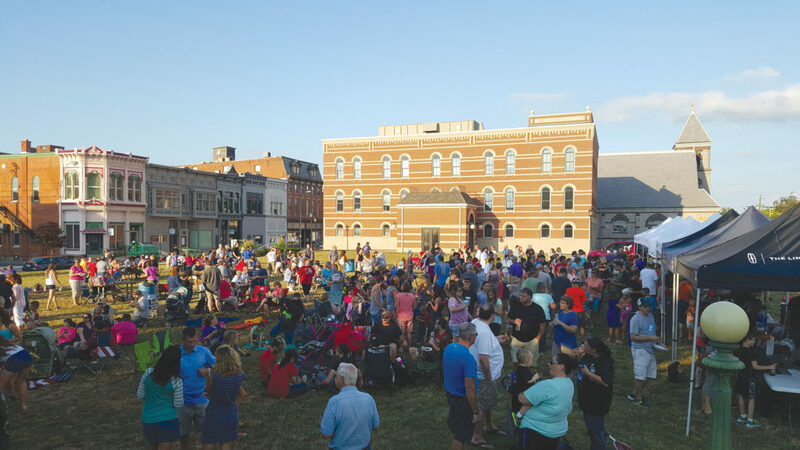 A crowd of people gathered for Pizza Palooza in 2016 in the downtown green space. Two Seneca Industrial and Economic Development Corp. managers have worked to save and improve an event created by families for families. Pizza Palooza, an annual event sponsored by Reineke Family Dealerships that was created in 2011, nearly ended three years ago. That’s when SIEDC Development Manager Bryce Riggs said he was approached by SIEDC Communications Manager Katie Lang. “She told me, ‘You like pizza, I like pizza … let’s save (the event),'” Riggs said. She said this hard work could lead to the event’s most successful iteration. “We are expecting it to be the biggest year ever,” she said. Lang said this year’s event, which is 6-9 p.m. Saturday, is expected to have the largest turnout and will have the most vendors in the event’s history. She said attendees can purchase $1 tickets that can be redeemed for a slice of pizza from any vendor, potato chips provided by Ballreich’s, soda or water provided by Hempy Water. Fifty cents of each ticket sold will go toward downtown revitalization. Vendors are to include Domino’s Pizza, Fort Ball Pizza Palace, A.J.’s Heavenly Pizza, Jac & Do’s Pizza, Kona Ice Findlay, Marco’s Pizza, Napoli Pizza, PJ’s Brickhouse, Reino’s and Simply Susan’s, which is to provide chocolate pizza. Riggs said vendors will be set up in the Tiffin-Seneca Public Library parking lot. After attendees get food and drinks, there will be seating available in the area, including in the East Green Complex. Riggs said he believes the event will showcase downtown Tiffin and give families a chance to spend time together. “For families, we think it’s a regional draw,” he said. “It’s something the whole family can do together,” she said. Doug Riggs, Bryce’s father, said the event will give children an entertainment option and bring more people downtown. “It brings family and friends together, it brings parents and children together,” Doug Riggs said. Lang said transportation is to be provided through the evening to the St. Joseph’s Festival. “There will be a continuous route,” Bryce Riggs said. He also said parking maps will be provided on the event’s Facebook page closer to the event. Bryce Riggs said Pizza Palooza is just one event occurring downtown Saturday. The morning starts with a downtown farmers market 9 a.m.-1 p.m. At 7 p.m., there will be live music from local band Rusty Vinyl at the East Green Complex. At about 9 p.m., “The Incredibles” is to be shown at the East Green Complex. The movie will be displayed on a giant inflatable screen on the performance pavilion. He said attendees should bring blankets to sit on. Bryce Riggs said he believes the event should be fun for people of all ages.